Kjaer at his last Aberdeen home game against Partick Thistle. As the last Aberdeen player to go to a World Cup, this time every four years brings back fond memories for Peter Kjaer. It is 16 years since Kjaer, in the twilight of his career, packed his bags after his first season at Pittodrie and headed for the Far East with Denmark. A second-round exit at the hands of England brought an end to his international career, which had yielded just four appearances for the senior side but a career’s worth of experiences going away with the national team. Back-up to Peter Schmeichel at France 98 and Euro 2000 and then Thomas Sorensen in Japan and South Korea, the lack of game-time did not dim his experiences. 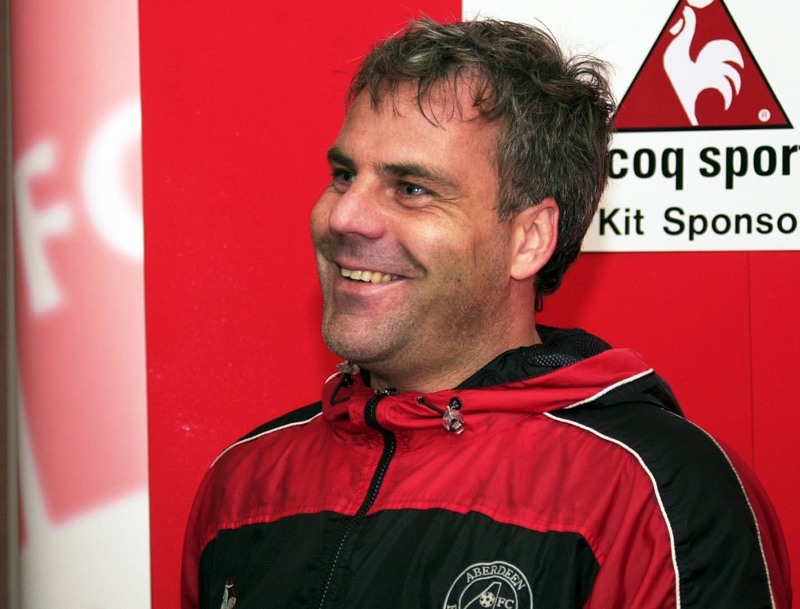 In 1998 he witnessed one of Denmark’s best World Cup performances in the 4-1 win over Nigeria, before a last-eight elimination at the hands of Brazil. Four years later he was on the sidelines as the Danes sounded the death knell for a flailing France, defeating the world champions 2-0 and sending them home. Denmark topped Group A.
Kjaer said: “France was the big game because they had a very good team. Zinedine Zidane was injured and I’m not sure he played the other games. But the last game against us we had a man marking him, even though he was a little bit injured. We celebrated a lot after that. We had some beers in the hotel – Morten Olsen is normally a hard guy but he allowed us to. Our wives came to see us but they didn’t stay with us. “I was lucky to be in squads with the Laudrups and (Peter) Schmeichel – world-class players. I remember people talking about us maybe winning the tournament in 1998, after we beat Nigeria. There was a feeling we could go the whole way to the final. We had good ‘working’ players, who worked hard all the time and a very good squad. 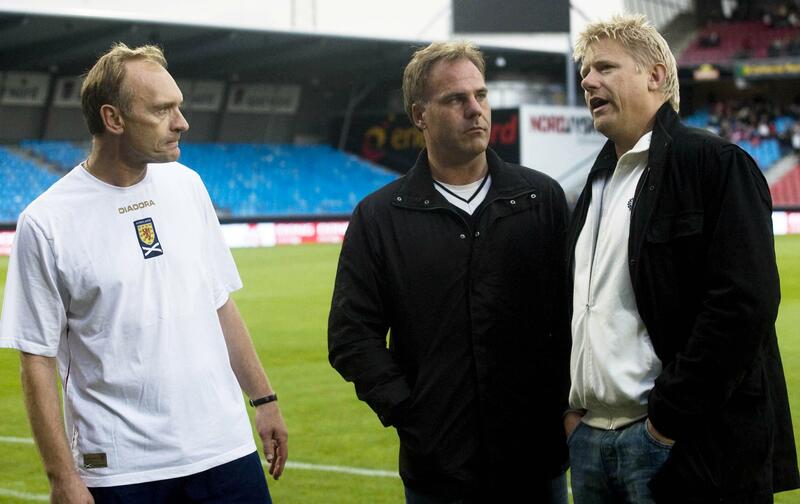 Peter Kjaer (centre) chats to Jim Leighton and Peter Schmeichel at a Denmark v Scotland under-21 game in 2008. A 2-1 win in their opener against Uruguay and an entertaining 1-1 draw with Senegal sent Denmark through to the round of 16 unbeaten. For the 2002 World Cup a new generation had embedded themselves in the national side. Brian and Michael Laudrup had gone, as well as Schmeichel, with Jon Dahl Tomasson, Sorensen, Thomas Gravesen, Dennis Rommedahl and Jesper Gronkjaer mainstays of Olsen’s setup. The Japan-South Korea tournament was heralded as a new frontier for the global game. It was the first time the World Cup had been held in Asia, as Fifa attempted to tap into one of the fastest-growing regions in the world. For Kjaer, little was different. He said: “When you’re out there it’s simple; it’s just a tournament played in another country. When we played South Africa in 1998, we had some problems with the heat and guys lost a lot of weight. But it wasn’t a big problem in Japan and Korea. We had our own cook so we had we had the food we liked. He obviously knew how to prepare food for football players. “We were based in Japan and moved around. We had a training camp in Denmark and then a couple of days off before we flew. Tournaments can be quite hard if you’ve got a week between games, particularly if you’ve not had good results. Kjaer recalls his time with Aberdeen as some of the best years of his career. The Dane only spent two seasons at Pittodrie but was in the side that finished fourth in 2002 and played in the Dons’ 100th game in Europe against Hertha Berlin. Kjaer shares a joke with fellow goalkeepers Ryan Esson and David Preece. 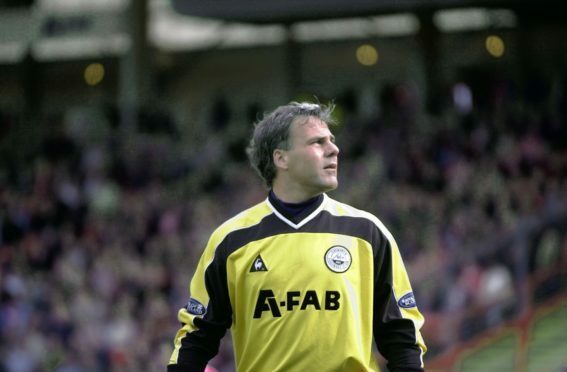 Alongside David Preece and Ryan Esson, he was part of a close-knit union of goalkeepers, under the watchful eye of club legend Jim Leighton. Manager Ebbe Skovdahl brought him to the Granite City, after working the Kjaer for Danish side Vejle. He said: “It was a good time for me. Some of the best times for me and my family were there and I feel lucky to have had a couple of years in Aberdeen. I knew Ebbe before as he’d been my coach in Denmark – I was happy to work with him again. He was a tough guy and tough on himself. Even when he was ill, he would still be on the training ground. “He had success at Brondby and after his first season, he got rid of some of the older players and started to build a team of his own. We finished fourth in my first season and got to play in Europe. “David Preece and Ryan Esson were both nice guys. We had a good small group of goalies and Jim Leighton was the big father for us all. David came to Denmark and played for my old club Silkeborg and I talked to him when he was over here. “We were unlucky against Hertha Berlin. Michael Preetz scored a few minutes from the end. They were a big club and I remember the stadium was being rebuilt at the time. We had some good players and could have gone through. “I was back when Aberdeen played Copenhagen and won 4-0 – it was a marvellous game for them. They had some injuries at the time and the talk was that Copenhagen were going to beat them for fun. All the Danes were caught by surprise and didn’t think they could play like that. That was maybe the last time I was at Pittodrie. Kari Arnason’s move home to Vikingur in Iceland preserve’s Kjaer’s status as the last World Cup Don. The former international now works as a pundit on Danish television. He works now as a television pundit for TV3 in his native Denmark and as the channel does not have broadcasting rights for this year’s tournament, the 52-year-old will take it in from the other side of the camera. He has high hopes for the current iteration of World Cup Danes, with Tottenham’s Christian Eriksen the lynchpin of any success for Age Hareide’s side. Kjaer said: “The expectation is quite good in Denmark. They will be disappointed if they don’t go through the group – they’ve got the potential to finish second. We should beat Peru and Australia; people expect the team to go to the next level. Even with his playing career 15 years in the past, calling time on it after his second year at Aberdeen, the fondness with which he recalls his halcyon days brings a smile.